Washington – Now that Donald Trump is the presumptive Republican nominee, it’s time to start looking at general election match-ups between him and the likely Democratic nominee Hillary Clinton. 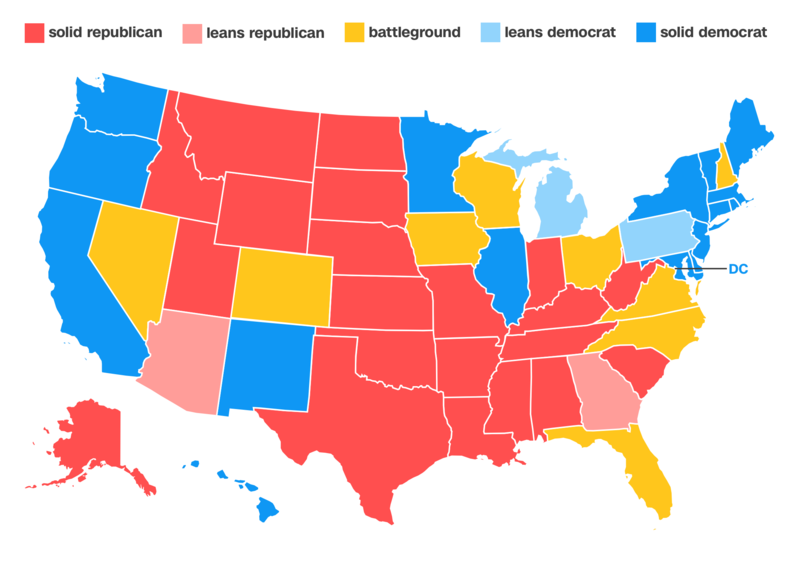 Here’s the CNN Political Unit’s first look at the battleground map of 2016. This is where the state of play begins. Trump could confound some of these assumptions, but we’ll need to see polling data, campaign organizing and spending, candidate schedules, and campaign engagement before we can adjust the playing field. And we will do just that as often as the campaign game plans dictate. Donald Trump has already suggested some of the first opportunities he sees to potentially flip the map in the industrial Midwest. Trump hopes to reawaken the so-called Reagan Democrats who once helped put states such as Michigan, Pennsylvania, Wisconsin, and Ohio in the GOP column. Conversely, the Clinton campaign sees significant demographic advantages in traditional battleground states such as Nevada and Colorado and perhaps even in reliably (of late) Republican Arizona. The battleground map will evolve from now through the fall and just like the rest of this election season, it will be anything but predictable. Correction: The post has been updated to correctly reflect the number of electoral votes in Minnesota.